A town with 53,000 inhabitants on Brook Ikva, between Lake Fertő and the Sopron Mountains, one of the most important holiday and tourist resorts of Hungary. 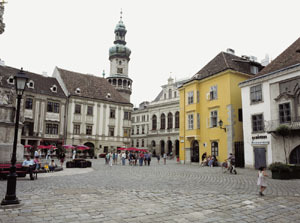 The image of the inner town is still dominated by the several medieval churches, the houses of medieval origin with gables and spacious courtyards and the narrow streets. There are fascinating 13th and 14th century houses and churches for the enthusiasts of Gothic architecture. The Fire-watch Tower, the symbol of the town, was given its present form after the fire of 1676. In the Main Square the Storno House and the exhibition can be seen, while in Orsolya Square the Lábasház (= Arcaded House) is worth visiting. The Saint Ursula's church with the nunnery and the school were built in Romantic style in the last century. The Esterházy, Erdődy, Széchenyi and Zichy-Meskó mansions witness that Sopron was a highly popular place of residence also among the families of Hungarian aristocracy. 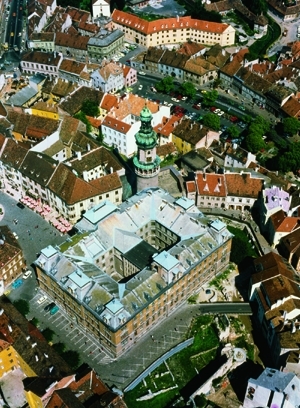 Collections of local history, scientific, industrial history, art and religious items are displayed in a total of 23 permament exhibitions in Sopron. Brennbergbánya, the first coal mine of Hungary, supplied charcoal to the industry of the region from 1752 to 1952. The Lövérek with the Károly-kilátó (= lookout tower) offer a pleasant walk with a popular pace of excursion. The Fertőrákos cave theatre and the Maria Magdalena church at Bánfalva are places of special interest in the neighbourhood. Visitors should not miss to taste Kékfrankos, the famous Sopron wine.